The Cuba Libre is a true guilty pleasure drink for us. At its most exalted, it can be described as having subtle vanilla and cinnamon notes, supported by baking spices, banana peel, and raisins, rounded out with bright acidity and tang from fresh lime juice. At its most basic, you can think of it as a fancy rum & Coke. But while it shares the same building blocks as the heavily binged club favorite, the Cuba Libre is a bit more grown up and better suited for casual escapism than reckless intoxication. 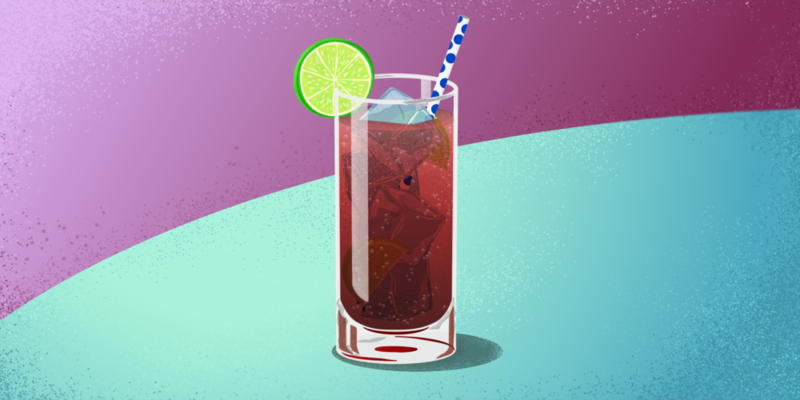 The origins of this drink are a little murky, but popular lore places the creation around the turn of the century during Cuba's fight for independence from Spain. Literally translated to "Free Cuba", Cuba Libre was a common rally cry–one that would certainly raise spirits in the form of a toast. It didn't take long before the mix of local lime juice, Cuban rum, and Coca-Cola made the 90 mile journey north to the Florida Keys along with the moniker Cuba Libre. So does a fancy rum & Coke mean that you have to make your own cola syrup from scratch like The Greatest Japanese Bartender? Not at all! Used sparingly in a cocktail, cane sugar based colas like Mexican Coca-Cola are readily available at most grocery stores, and provide the same complex spice and sweetness you could hope for from any decadent simple syrup. It also makes for an incredibly easy drink to build correctly without having to carefully prepare ingredients. Fill a tall collins glass with ice. Add rum and squeeze 2-3 lime wedges worth of juice into the glass. We also like to toss in the whole squeezed lime wedges for extra zest. Top it off with Mexican Coca-Cola and give it a brief stir with a bar spoon to mix it all up. Take your time with this classic and enjoy! In some of the darker corners of the cocktail world, daiquiris have emerged as syrupy frozen concoctions eager to give you brain freeze and a morning full of regrets. They're served in comically large styrofoam cups and come in exotic flavors like Banana Banshee and Red October. And while these concoctions born from flavored mixes and cheap rum have a place in dive bars and drive-throughs, they're now closer related to slushies than one of Cuba's contributions to classic cocktails. Made properly, a daiquiri is clean and crisp with balanced sweetness–a far cry from the Weekend At Bernie's version that bares the same name. The classic daiquiri recipe consists of just three ingredients: good quality silver rum, fresh squeezed lime juice, and a touch of sugar. No pre-batched mixes or artificial flavors required. The 3 unadulterated ingredients are shaken vigorously together with ice until the resulting cocktail is nearly freezing. Hailing from Cuba, this drink was thought to have been originally created as a way to fight off Yellow Fever (seems legit). Stationed Navy sailors then brought this drink stateside in the early 1900s, and was perhaps made most famous for being Ernest Hemingway's drink of choice in his Cuban vacation days. Whatever the exact history, we're happy the daiquiri has lasted the test of time. Here's how to make a classic daiquiri. Fill a cocktail shaker with ice. Add rum, lime juice, and simple syrup and shake vigorously for 20-30 seconds. Make sure to shake hard until the shaker is ice cold. Strain into a coupe glass and garnish with a lime wheel.